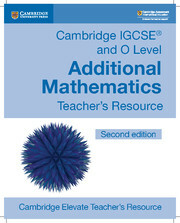 These resources have been created for the Cambridge IGCSE® and O Level Additional Mathematics syllabuses (0606/4037), for first examination from 2020. 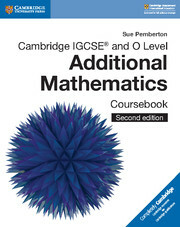 This teacher's resource has been designed to accompany the Cambridge IGCSE® and O Level Additional Mathematics Coursebook. It contains notes for lesson planning, PowerPoint presentations to help you explain new mathematical skills, exam practice and worksheets. Cambridge Elevate is simple and easy to use – personalise the text with annotations and find your notes quickly with highlights and bookmarks. This resource contains answers to both the coursebook and practice book to save you time when marking. If you wish to buy this resource, we will email you a book code - please contact your sales consultant or customer services. Your digital teacher's resource gives you access to everything you need to plan your teaching. Choose from editable Word files or PDFs for lesson plans and worksheets, and download supporting files, such as guidance documents for using digital resources, from within the resource. Detailed lesson notes help support teachers when planning maths lessons. Supplementary worksheets support and challenge students, helping each learner reach their potential. Detailed PowerPoint slides with worked examples for classroom demonstrations. 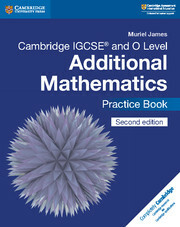 Contains answers to the coursebook and practice book to save time when marking.